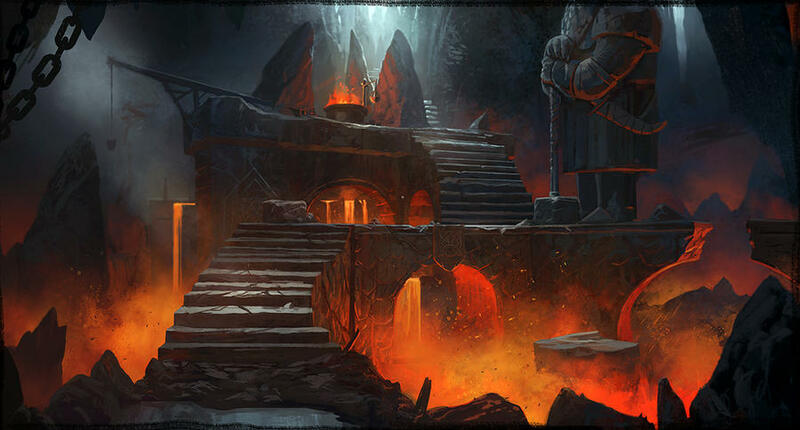 Deep within the tunnels from the jagged mountain is the firey glow of a roaring forge where a single Hrothi family is gathered fleeing The Deranged King’s Conquest and his tyranny. They’re a group of adventurers who were looking for a better life through solitude during uncertain times, all with their own specialties and skillsets. One can be seen hammering metal on an anvil, sparks showering the floor around him with each strike against the glowing metal. A solitary Hrothi in full armor and armed to the teeth stands guard the cave entrance to their home, staying vigilant and dutiful. Others are sitting near the forge listening to a silver-tongued Hrothi telling the tale of their dangerous expedition to the jagged mountain for a better life while others nearby are trying to listen in as they strike at rich veins. Following the tunnel out of the cave a small group of Hrothi can be found hunting for food and gathering wild vegetables growing in the harsh soil. One brave soul ventures out of the warm, protective caves into the open world to find nearby settlements to trade with. On his journey he finds new settlements recently built and begins trading with them proclaiming himself a Redforge, a name the family derived from the story of the forge they say they spawned from. Decades pass and the adventurous Redforge family find themselves becoming more popular with the local settlements they trade with. Their weapons and armor are highly prized by the nearby Brudvir, and the neighboring Kypiq, while interested in finding the location of the Redforge settlement, prize the stout cave mushrooms the Hrothi trader brings them. Finally the time has come to abandon their safe haven and merge with society once again as the age of the Deranged King has come to an end. House Redforge heard rumors of a clan that brought various tribes together for peace, prosperity, and protection. So, in the year 702 they gathered their belongings and set out for heart of the newly formed kingdom, the city of High Revburgh. House Redforge settled into the city and kept to themselves for the most part. They observed others to learn the social hierarchy and rules while hiding the precious metals and gems they brought with them from their cave. Word reached their ears of an archery and jousting competition in a nearby county. No word was spoken of a prize for the winner, but Magnus Redforge, the most competent of the Redforge to compete in the tournament, set out to win whatever the prize might be and bring recognition to the family name. On his travels to Helgrim County he stumbled upon a merchant selling a drink he called “fire water”. He bought two jugs without sampling it and supplemented the woody taste of the “fire water” into his mead believing the salesman’s lie that it would bolster his strength and mental awareness. This mistake cost him to lose in both the archery and jousting events in Helgrim. He traveled back to the Redforge home in High Revburgh, warned them of the potent drink, and shared the tale of how a fellow Hrothi of the Drednir Clan won the jousting event. Magnus’s failed attempt at the tournament caused him to look to other avenues to bring respect to the Redforge name in this foreign land. He decided to show the Kingdom of Vornair how humble and selfless the Redforge family was by birthing the first delivery system for the kingdom creating “Don’t Kill the Messenger” Courier Services. Magnus continued to hone his skills in riding and archery and taught them to his children. He also taught them the values of community, generosity, fairness, and benevolence. The other members of the Redforge family continued to work on advancing their various skills to bring profit to the family. Together, they would help bring prosperty, protection, and innovation to their new home in Vornair. There was one Redforge who did not go into hiding, Ostin. He went to battle instead of hiding in shelter with the others and was lost from the rest of the family for years. After the fighting ended Ostin Redforge eventually found the rest of the family nestled in High Revburgh of Vornair and was once again reunited with his kin. Ostin's returned with rewards for his achievements in battle for his unmatched courage and heroism on the battlefield. He returned with an earned suit of armor, caparison, barding, and a horse all of which was adorned in the colors of Velsheland, who he fought for. The rest of the family was utterly impressed he had even come back at all as fighting outside the safety of the caves was not smart for any Hrothi to do. They celebrated his feat of bravery with food, drink, and a song to carry on his legacy. For the rest of his life Ostin continued to fight for justice anywhere he could. He lived to be 108 years old. House Redforge aims to prosper and enjoy the game through family ties and family friends. There are many benefits to being part of a family, and joining house Redforge can only increase your gameplay experience. Whether you’re an RPer, min-maxer, PvE enthusiast, PvP enthusiast, or crafter, there will always be those with similar aspirations and level of skill as yourself in the family. Banding together we can help each other have a fun and meaningful gaming experience. House Redforge is a benevolent and generous group of Hrothi. They value profiting through hard work and sharp wit rather than taking advantage of others. They understand there is more value in friendship and experiences than in gold and gems, though they do not think there is no worth in precious metals or currency. They follow the teachings of the Virtori as do most Hrothi, but do not hold any prejudices or suspicion of the Kypiq. They strive for peace and prosperity through a strong community as it is a better deterrent than a strong arm. However, this does not make them weak. Members of house Redforge are able and willing to defend their possessions, family, and community to the death. Experts in the use of crossbows, axes, and mauls ensure them victory against any who attempt to assault them. While not holding prejudices against the other races, house Redforge embraces other Hrothi families higher than others in the kingdom of Vornair as to preserve and advance Hrothi cultural influence. If your goals and principles are aligned with what is stated above, you plan on playing in the Kingdom of Vornair, and you eagerly look forward to playing a Hrothi send me a message about joining the family.